Parma Ham has five bones, which have to be removed as you slice it. The first part of the bone to be removed is the so called "nocetta" (the inner part of the leg) that can be taken off cutting meat all around in order to create a cone under the bone. Then the second bone, which has to be removed, is "anchetta" , placed in the inner part of the leg in an oblique way. In this case you have to work with a raked knife blade, making small cuts and repeating the round movement. You can go on cutting Parma Ham until you find the long thigh bone, which you have to remove cutting the meat lenghtwise, paying attention not to chip the bone. Then, with a specific small knife, you have to slowly take off the meat's bone. Moreover, it is possible to realise cuts of different measures, suitable for all different types of consumption. In conclusion big portions are obtained dividing Parma Ham into three parts: "gambo" (leg), heart and the part under the bone (ideal for cuts with knife), instead for little portions you have to divide Parma Ham into 5 or 7 parts. Fiocco is obtained removing the lateral part. For practicality’s sake, then you can divide it into two parts: leg and heart. 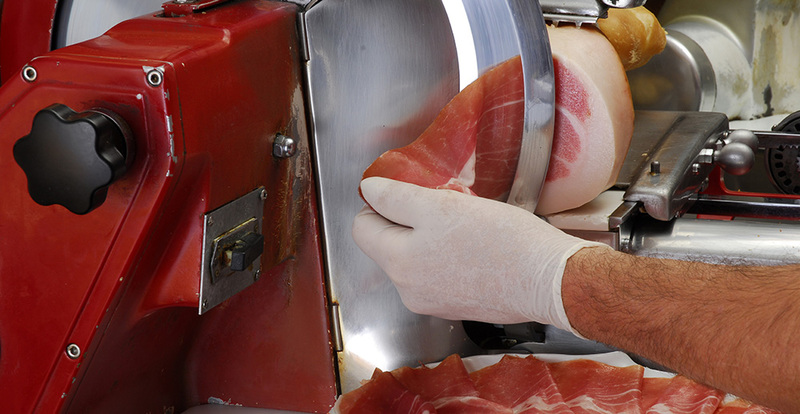 Parma Ham has to be rigorously cut with the slicer. Moreover, you start to cut it from the tip and you carry on up to the leg, removing the rind little by little. Then cut it into very thin slices, possibly at the moment of the consumption. It is important not to remove all rind because it is useful during the preservation and it keeps soft the product. Furthermore, grease helps to give to Parma Ham its distinctive flavour. The area of the cut must be always clean in order to avoid rancid tastes. What with a cut and another one, you have to preserve the product in a fresh and dry place. In order to better taste Parma Ham, it is strongly recommended to consume it when it has been just cut. If you buy the product that is pre-sliced in a package and put it into a bowl, it must be preserved in the refrigerator at a temperature included between +1-7° and you have to open the package 5/10 minutes before consuming the product. As far as whole Parma Ham with bone is concerned, it must be preserved in a fresh and dry place, at a temperature included between 15-20°, until the moment of the use. Once cut, it is necessary to cover the cut part with the transparent foil or the aluminium foil and to put the product in the refrigerator. Everytime that you start to cut the product again, it is recommended to throw the first slice aside because it can tend to oxidize or dry. On the other hand, if the product has been deboned entirely or in slices and vacuum-sealed packaged, you can follow this simple advice , in order to preserve it : you have to cover the superficial cut part with the transparent foil or tin foil, then to wrap up the whole Parma Ham with the transparent foil or tin foil in order to avoid that it could absorb other smells; lastly you have to put the product in the refrigerator at a temperature of +1°C / +7°C.